We are a community of Fitness, Health, and Wellness Professionals raising the bar in the industry! BUSINESS OPPORTUNITIES AVAILABLE IN ALABAMA! Contact us to find out how you could own your very own Health, Wellness, and Fitness Business. 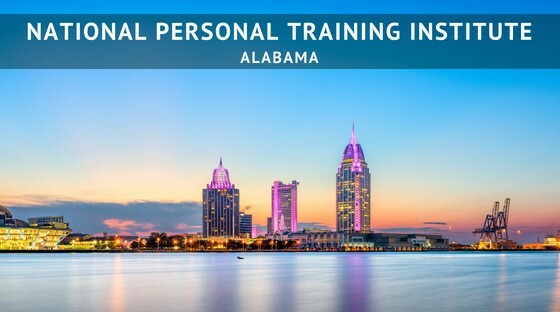 Welcome to the National Personal Training Institute of Alabama where you can get a quality professional development through hands-on experience in the gym. Step into the gym with confidence! Whether you are on the path to personal betterment, or to change the lives of others, or just wanting to be at the top of your game within your Fitness Career; we provide the opportunity for professional development, transformation, and confidence for all. After you get certified online from the National Personal Training Institute Certification Program, or Master Personal Training Diploma – or any other Degree or Certification – we will help you find your practical hands-on externship within a gym or trainer of your choice! We currently offer online Continuing Education (CEUs) that allow freedom of online, self-paced learning with interactive videos to enhance your learning experience, and memberships that will support you through your entire career and/or healthy life journey. COMING SOON! Phenomenal hands-on workshops that will boost your confidence and give you the competitive edge needed in the industry. Click the link above and register for your online program. Reach out to Elizabeth Bowen and let her know which class you signed up for so that she can assist in making your journey a personal and successful one. Have a blast, join our online community on Facebook, check out the rest of our educational website, and find joy in knowing you have a direct link to Health, Wellness, and Fitness Leaders world-wide. Please contact Arik Wiest for more information about what the state of Alabama has to offer. We love partnering with gyms. Our gym partners benefit by getting first pick of our community of Fitness Professionals looking for a job or change of location. We also feature the gym on our website so they are directly associated with quality education and Fitness Professionals that are “Raising the Bar” in the Fitness Industry. Contact us to find out how you can be partnered with excellence!